I like having notifications of what’s happening throughout my network. It helps me to know what to say when there’s a phone call saying there’s a problem (most of the time, “no, the network isn’t down“). However, there is a limit on how many similar notifications you can get before it stops becoming useful. I’d say once every 2 minutes falls way into this category. This wouldn’t be too bad (if it’s a serious problem, I want to be informed), but I cannot find a way to acknowledge them. So for them meanwhile, I’m having to filter through and delete them. Sigh. So what are you telling me then? 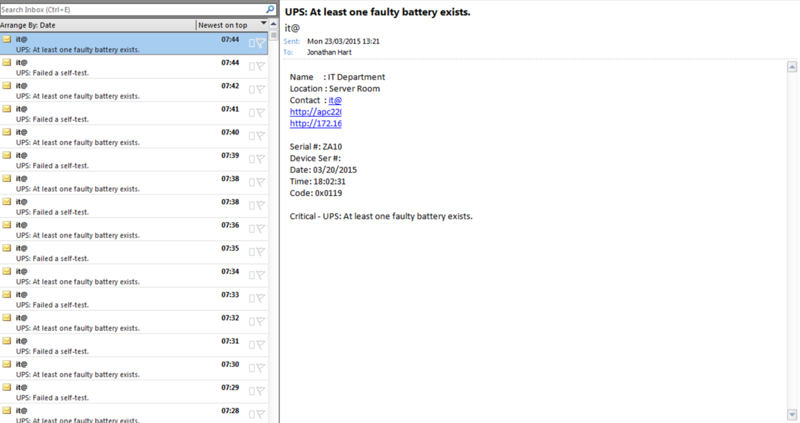 In other news, the UPS in work has a battery that needs to be replaced. Just thought you may want to know. Posted in Annoyances, Network Management.